Aims/Objectives: To evaluate the effect of glass and polyethylene fiber inserts and flowable composite as a liner on the microleakage of Class II composite restorations with gingival margins on root surfaces. Materials and Methods: Class II slots were prepared on both the proximal sides of thirty freshly extracted mandibular molars and were divided into six groups, according to the type of fiber insert and use of flowable composite (Filtek Z350) as a liner. Filtek P-60 (3M/ESPE) posterior composite was used to restore all cavities. The specimens were thermocycled and stained with 2% Basic Fuchsin dye, and sectioned to evaluate the dye penetration under Stereomicroscope. Statistical analysis was done using Kruskalwallis test and Mann whitney U test. Results and Conclusion: This study showed that, fiber insert groups, with or without flowable liner, had reduced microleakage scores as compared to the control groups. However, statistically no significant difference was found between the groups with fiber inserts. 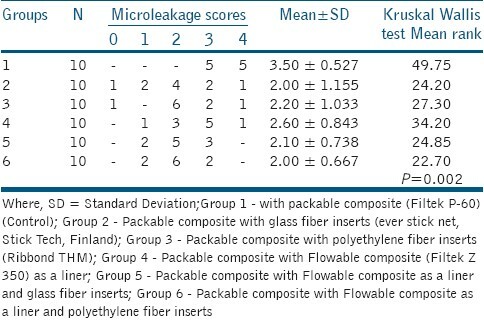 Less microleakage was seen in Group IV (With flowable liner and without Fiber inserts) as compared to Group I (Without flowable liner and Fiber inserts). Thirty freshly extracted intact molars (for periodontal reasons) were collected from the Department of Oral surgery. The teeth were cleaned with periodontal scalers. The molars were mounted on Plaster of Paris bases up to 2 mm apical to the cement enamel junction, and stored in distilled water in a refrigerator. Class II slot cavities were made on both the proximal sides of molar using a #245 tungsten carbide bur (SS White, USA) in a water-cooled high-speed air turbine handpiece. The dimensions of the cavities in the gingival floor were as follows: Mesiodistal width=2 mm; buccolingual width=3 mm; gingival floor=1 mm below the cemento enamel junction. The dimensions of the cavities were verified with a periodontal probe. 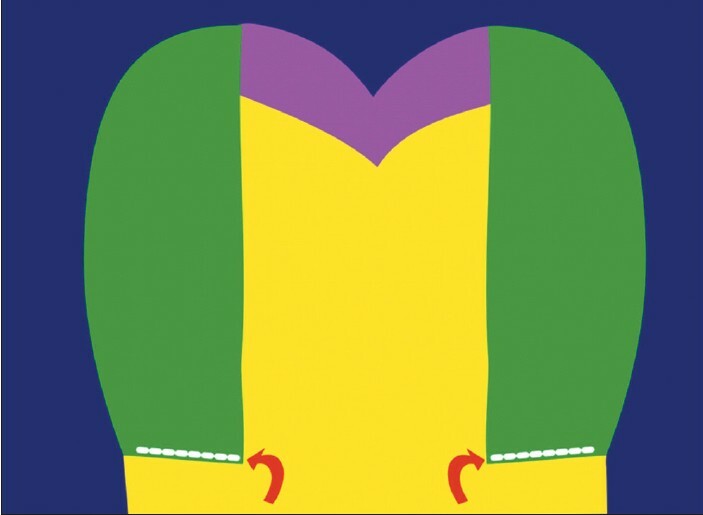 Teeth with prepared cavities were randomly divided into six groups. A universal metal matrix band/retainer (Tofflemire) was placed around each prepared tooth, and was supported externally by applying a low-fusing compound which helped to maintain the adaptation of the band to the cavity margins. Each cavity was cleaned with water spray and was air-dried for five seconds. Bonding agent (Adpersinglebond 2, 3M ESPE) was applied according to the manufacturer instructions. A posterior resin composite (Filtek P60, shade B2, 3M/ESPE) was used to restore all the cavities. The restorations were divided into six groups according to the assigned type of fiber insert and flowable composite (Filtek Z350) as a liner. Cavities without fiber inserts were used as controls. Group 6- Packable composite with Flowable composite as a liner and polyethylene fiber inserts. 4=Dye penetration along the gingival and axial wall. Data was statistically analyzed with non-parametric Kruskal-Wallis test and Mann-Whitney U test. The means and standard deviations of microleakage scores of all the groups is presented in [Table 1]. In general, the fiber inserts group had less microleakage as compared to the control groups. Test of significance of these mean scores between different study groups by Kruskal-Wallis analysis of variance (ANOVA) showed that there was statistically high significant difference (P=0.002). Analysis with the Mann-Whitney U test showed significant differences in mean microleakage scores between controls with P<0.05 (Group I and Group IV), and between Group I and the group with Fiber inserts with P<0.01. However, there was no statistically significant difference in the mean microleakage scores between the fiber inserts group (P>0.05). Fibers replace part of the composite. The fibers resist the pulling away of the initial increment of composite from the margins towards the curing light. The use of fiber inserts' significantly reduces microleakage in Class II resin composite restorations with gingival margins on the root surface, as compared to the restorations without fiber inserts. Use of flowable composite as a liner also helps in reducing the microleakage. No significant difference is seen in the microleakage between the different fiber inserts groups; however, further studies are required to find newer methods and materials to reduce/eliminate the problem of microleakage along the tooth-restoration- interface. 1. Mackenzie L, Shortall AC, Burke FJ. Direct posterior composites: A practical guide. Dent Update 2009;36:71-2, 74-6, 79-80 passim. 2. Estafan D, Estafan A, Leinfelder KF. Cavity wall adaptation of resin -based composites lined with flowable composites. Am J Dent 2000;13:192-4. 3. Krejci I, Sparr D, Lutz F. A three sited light curing technique for class II conventional composite resin restorations. Quintessence Int 1987;18:125-31. 4. Feilzer AJ, de Gee AJ, Davidson CL. Curing contraction of composites and glass ionomer cements. J Prosthet Dent 1998;59:297-300. 5. Kidd EA. Microleakage in relation to amalgam and composite restorations. Br Dent J 1976;141:305-10. 6. Miller MB, Castellanos IR, Vargas MA, Denehy GE. Effect of restorative materials on microleakage of Class II composites. J Esthet Dent 1996;8:107-13. 7. El-Mowafy O, El-Badrawy W, Eltanty A, Abbasi K, Habib N. Gingival microleakage of Class II resin composite restorations with fiber inserts. Oper Dent 2007;32:298-305. 8. Attar N, Turgut MD, Gungor HC. The effect of flowable resin composites as gingival increments on the microleakage of posterior resin composites. Oper Dent 2004;29:162-7. 9. Belli S, Orucoglu H, Yildirim C, Eskitascioglu G. The effect of fiber placement or flowable resin lining on microleakage in class II adhesive restorations. J Adhes Dent 2007;9:175-81. 10. Bowen RL. Reduction of microleakage around composite restorations. J Dent Res 1987;66:246. 11. Hamza TA, Rosentiel SF, Elhosary MM, Ibrahim RM. The effect of fiber reinforcement on the fracture toughness and flexural strength of provisional restorative resins. J Prosthet Dent 2004;91:258-64. 12. Kolbeck C, Rosentritt M, Behr M, Lang R, Handel G. In vitro examination of the fracture strength of three different fiber - reinforced composite and all ceramic posterior inlay fixed partial denture systems. J Prosthodont 2002;11:248-53. 13. Bagheri J, Moazzami SM. Effect of light conducting intrawedge on hardness increase of the posterior composite resin restorations. J Mashad Dent Sch 1996;20:27-37. 14. Radhika M, Sajjan GS, Kumara Swami BN, Mittal N. Effect of different placement techniques on marginal microleakage of deep class-II cavities restored with two composite resin formulations. J Conserv Dent 2010;13:9-15. 15. Leevailoj C, Cochran MA, Matis BA, Moore BK, Platt JA. Microleakage of posterior packable resin composites with and without flowable liners. Oper Dent 2001;26:302-7. 16. Korkmaz Y, Ozel E, Attar N. Effect of flowable composite lining on microleakage and internal voids in class II composite restorations. J Adhes Dent 2007;9:189-94. 17. Yazici AR, Baseren M, Dayangac B. The effect of flowable resin composite on microleakage in class V cavities. Oper Dent 2003;28:42-6. 18. Kemp Scholte CM, Davidson CL. Complete marginal seal of class V resin composite restorations effected by increased flexibility. J Dent Res 1990;69:1240-3. 19. Nandini S. Indirect resin composites. J Conserv Dent 2010;13:184-94. 20. Mendonça JS, Neto RG, Santiago SL, Lauris JR, Navarro MF, de Carvalho RM. Direct resin composite restorations versus indirect composite inlays: One year results. J Contemp Dent Pract 2010;11:25-32. 21. Milleding P. Microleakage of indirect composite inlays. An in vitro comparison with the direct technique. ActaOdontolScand 1992;50:295-301.